A romantic and eclectic Parisian apartment was designed to be the refuge for a Florentine sculptor and her husband, a financier in London. Contemporary, refined, yet surprising, the interiors project was realized by Anne-Sophie Pailleret, who has been able to perfectly translate the dream of the client in an elegant Haussmannian building. 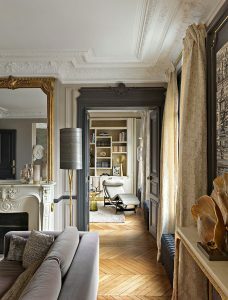 The first, dazzling contact of the clients and with the French interior designer and long assistant of Jean-Louis Deniot, was through the pages of a magazine “I saw an Anne-Sophie project and I was enchanted by it; it was a harmonious dwelling, embellished with objects and furnishings with a strong personality. I immediately understood that he was the right person for me, “confides the artist. 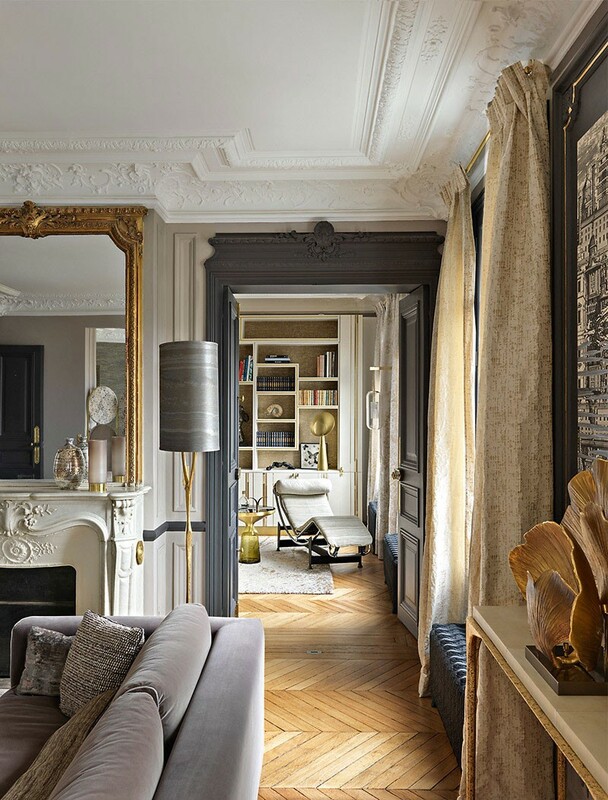 Classic interiors have been mixed with luxurious details of shades of gold, gray and pink, exquisite pieces of limited edition furniture, as well as an accent gray shade in the door portals. Like the one in the living room, with legs in a bird’s paw, signed Meret Oppenheim, a muse of Surrealism, Man Ray’s favorite model and author of eccentric visionariness. The art pieces highly by contemporary furniture with a classic breath. The entrance and the corridor are decorated with the charismatic two-colored graphics of the wallpaper.In addition, black and white graphic prints, kitchen tiles and a completely unique “one-of-a-kind”. Family legacy, the latter, together with the dining table and chairs of the same era, in full uniformity of style. “However, I insisted on an up-to-date intervention, deciding to change the table top. And I asked decorator Florence Girette to paint a pattern on marble that simulates marble“ explains Pailleret. “The interiors must have a soul, which is always given by some capricious and unexpected component”. Another unconventional choice was the exhibiting paintings on the walls, casting décor solutions an accentuated the eclectic style of the owners.